No stone was left unturned; the research encompassed all of the materials used in audio capacitors and any existing performance data together with analysis of manufacturing processes and techniques. The crucial factor to emerge was the effect that mechanical resonances within a capacitor have on sound quality and the importance of reducing or controlling a capacitor's sonic output. The MR range harnesses all of the knowledge gathered throughout the research programme and offers a superior product based upon science and research. In practice the MR range has found acclaim with industry experts, OEM's and audiophiles for its spatiality and excellent separation. 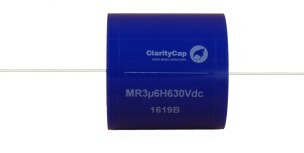 The capacitor employs a non standard polypropylene film, ultra pure aluminium metallisation and is housed in a coloured acrylic tube, the result of which is a capacitor which virtually eliminates internal sonic resonance. Terminals are hand soldered tinned copper. As a result the component is not offered with different colour schemes. A guaranteed 3% tolerance ensures component to component consistency for a balanced system and reproducibility across production runs. The graph below shows the relative sonic outputs between the SA (Traditional) and MR (Optimum Point) ranges.